This week I managed to get a proper finish on one of my old wip quilt tops…finally. 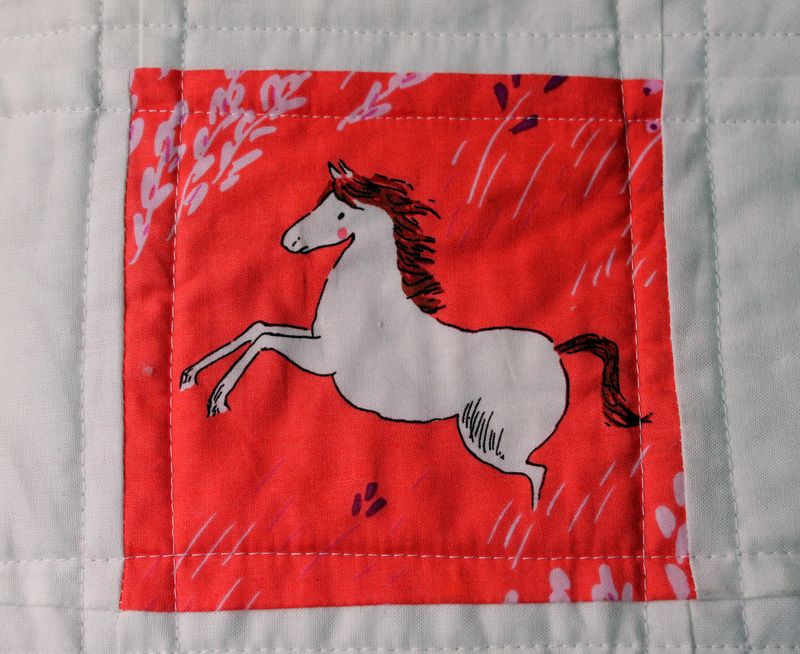 This darling quilt has been made for a friend’s daughter who lives on a horse ranch. 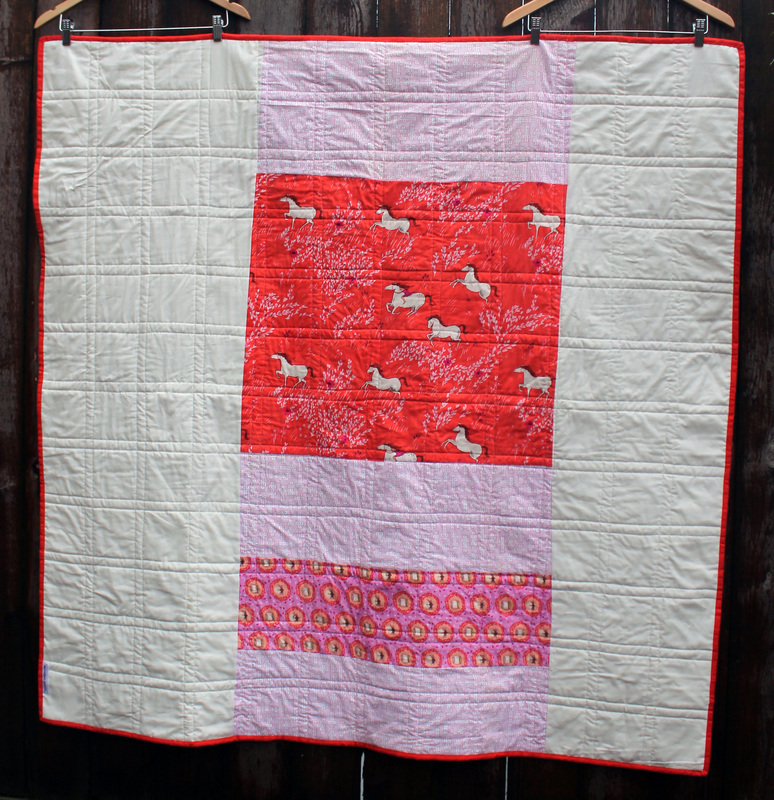 When I saw the fabulous fabric I knew I had to make her a quilt with these horses on it.. The block I used is a modern interpretation of a classic block. You can see my original post about starting this project from July last year, which includes a link to the block pattern HERE. Most of the fabric is from the Michael Miller Fabric’s Wee Wanders by designer Sarah Jane with a number of different blenders thrown in. I love the warm colour palette floating on the crisp white background. 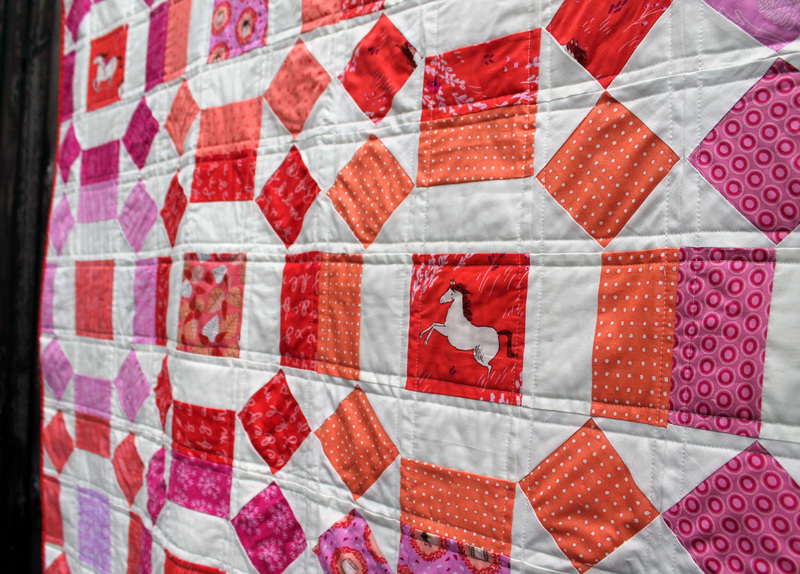 I must admit it was pouring rain this morning when I photographed this quilt, which means I did not get as many shots as I wanted. The quilt and the photographer were getting way to wet! 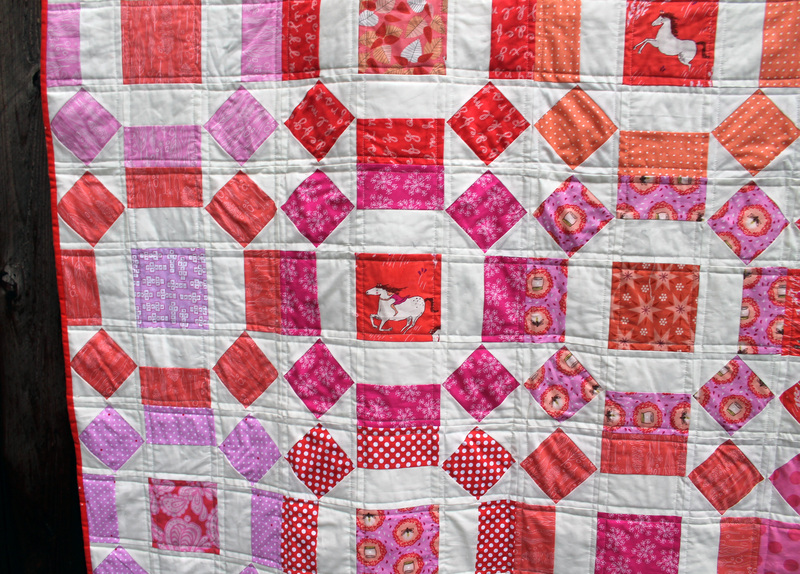 I did manage to get a quick shot of the quilt back which uses some of the left over pieces of Wee Wanders and Kona Snow. To finish up I used Kona Flame, a wonderful tomato red, for the binding. I love this quilt so much! I need to buy this fabric. And your sweet quilt labels. Such a great finish! Thanks Ashely… it is nice to have you back blogging…you were missed. Ravishing! I love the red/pink colour combination. Look at you, finishing up WIPs all over the place! You put us to shame, such an amazing output… This one’s gorgeous, I always find your colours inspiring. 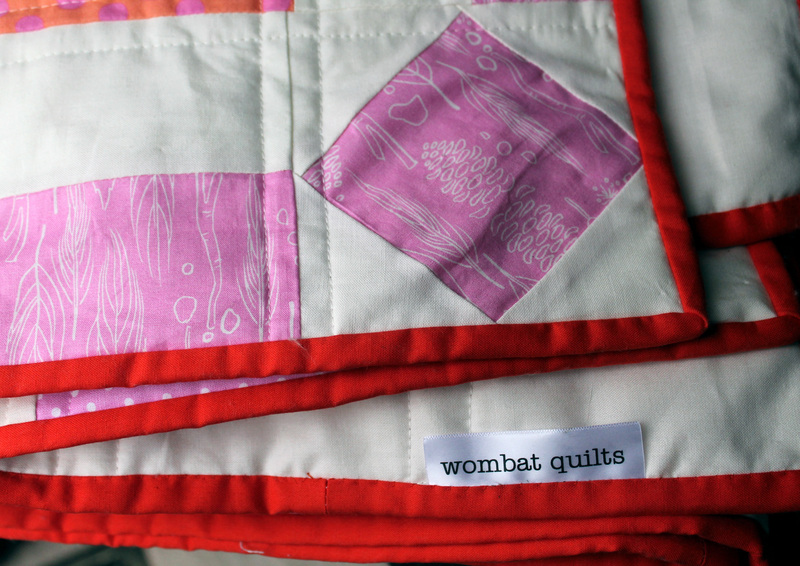 Thanks Kate…I also managed to finish your cushion cover…now I just have to remember to get to the post office! Oooh! So exciting! I just went to Spotlight and spent my birthday gift card on some gorgeous solid jewel colour fat quarters for my niece’s wedding quilt, and I thought of you as I picked up the violet, pink and burnt orange! The Wee Wander line is such a great print selection, and I love how these blocks really show off the prints. I bet this young lady is going to love the quilt so much! Gorgeous. I like how you butted the blocks together with no sashing. Lisa they seemed to fit nicely, but if I do the quilt again I think I will look at maybe sashing around the outside of the blocks…maybe! I love this one! It totally reminds me of an antique quilt that I have! What a gorgeous quilt! This fabric is so well suited to this pattern! 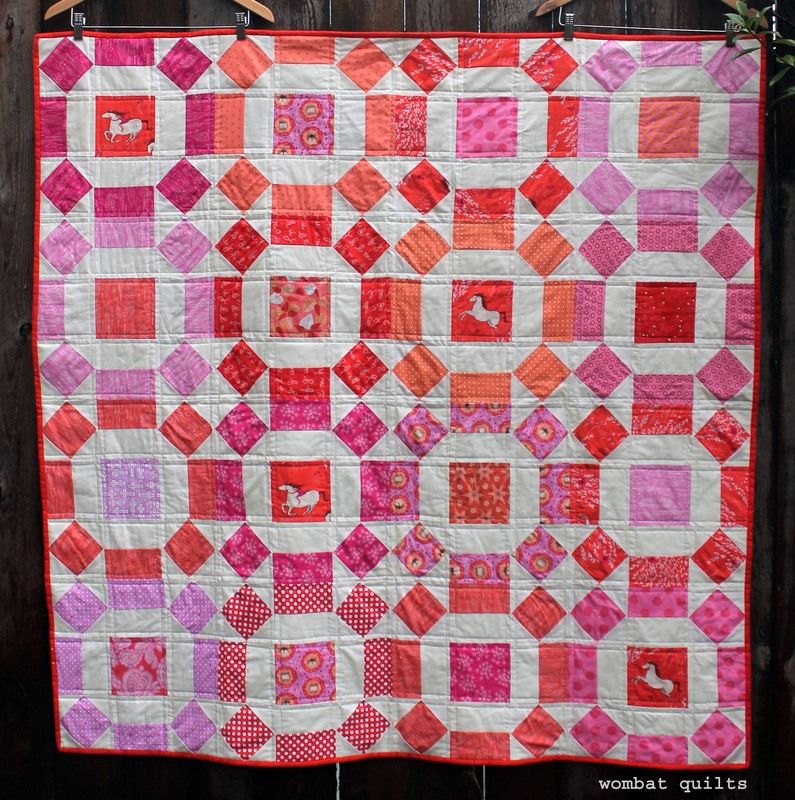 Such a pretty quilt, and I love how you use the extra fabric on the back. Nice finish. Well done on a finish. I still think this is a perfect quilt to use feature prints in largish areas. (Who wants a headless horse?) Lovely.